s.e.t. electronics GmbH (s.e.t.) offers a comprehensive modular EMS portfolio to support you in the development and realisation of your product ideas, irrespective of whether you are looking for new developments, enhancements to existing products or product optimisation. You decide which components of our modular EMS portfolio you want to use. Benefit from our competencies in all areas of electronics development, e.g. 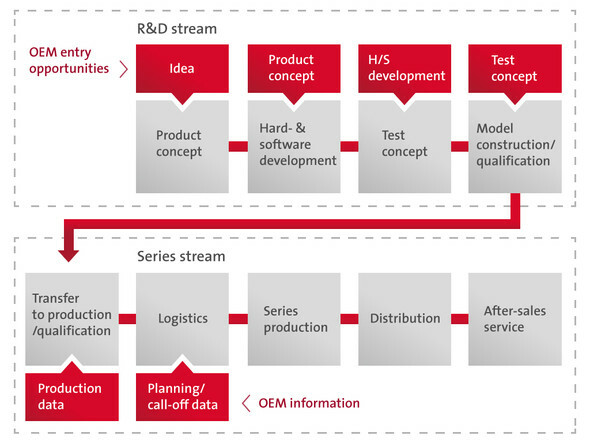 in the concept phase, in the hardware/software development phase and in the development of test concepts. Alternatively, you can rely on the 50 years of experience of s.e.t. electronics GmbH in the development and manufacture of electronic products and give us the responsibility of supporting your product along the entire product lifecycle. In this case we provide support all the way from product creation, through the industrialisation phase and series production, ending in an orderly and planned end-of-life management. Here you can find out more about the benefits of close collaboration during the development phase.